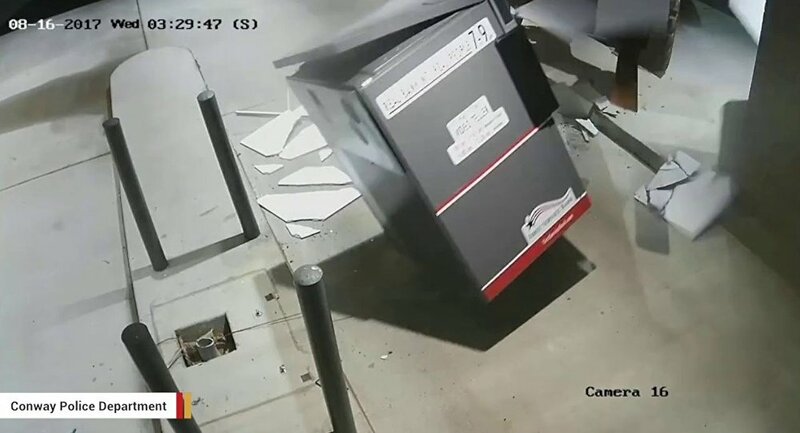 Police in Conway, Arkansas, are asking the public for help identifying the individuals or individuals who used a forklift to haul away an ATM with an unknown amount of cash inside earlier this week. The heist occurred in the wee hours of Wednesday morning. At around 3:30 a.m., somebody drove a giant CAT forklift up through the drive-through area of the First Service Bank in Conway, Arkansas. They knocked the ATM off its stand, bashing the roof and walls of the drive through in the process, and drove away with the big box of cash in a truck. A teller arriving at work the next morning noticed the damage. The Conway Police Department has posted the video on its Facebook page, along with ways the public can contact them with information. Gizmodo reports that the thieves might not be as clever as they appear: most ATMs these days have embedded GPS trackers. These guys or gals might need something quicker than a forklift to outrun the law.